Chakotay receives a message from Seska that Culluh is going to kill the child she conceived by him when he was being held captive by the Kazon. 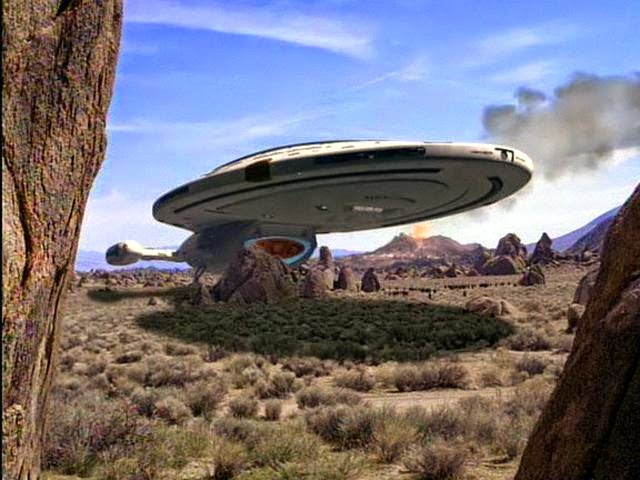 It could easily be a trap, but can Chakotay ignore the danger to his son, if it even is his? Kevin: There is a lot to like in this episode. I like that the episode revisits Suder, and wish they had kept him around longer. I am glad that the crew realized early on it was clearly a trap and chose to proceed carefully. It is far better than them having to act stupidly to carry the plot forward. That does come apart a little once Tierna comes on board, though. I really liked the conversation between Chakotay and his father. I am thrilled that the writers of Star Trek understand both the bodily integrity and personal autonomy issues related to becoming a parent. The character side of the show is pretty great. The aforementioned scene between Chakotay and his father is great. The scene with Janeway and Chakotay in the ready room is also really interesting and layered. The scene between Janeway and Suder was great too, if a little extraneous. She really couldn't have reviewed that report in her ready room? Matthew: There are things to dislike here, too, but I think they are all balanced by superior scenes like the ones you mentioned. The Kolopak scene especially was interesting, and riveting, really. Was it really his father's spirit? Was it some manifestation of Chakotay's own psyche? The mystery is never explained, and we're left with a well done, heartfelt conversation in which past sins against conquered peoples are touched on. I too liked the idea of the crew planning contingencies for an obvious trap. Kevin: My complaints with the episode come from a few angles. First, there is a pacing issue once we get to the actual Kazon plan. It's repetitive and it takes up too much of the episode. It also doesn't make sense that such an important system doesn't have a back up, or that the repeated attacks would not give away what the real target was. I also don't buy that the Kazon have access to technology with such destructive force that is invisible to Voyager's sensors. Explosions require energy, be in chemical, kinetic, nuclear, etc. In any event, that much potential energy should have triggered something. Second, the whole episode became the set up for them being stranded and it's the far more interesting idea. I think they could have picked up the episode in the middle of the stranding and filled in the gaps with flashbacks. My other main problem is that between Secret Suder and the question of Tom's shuttle, they really telegraphed where the eventual solution would come from. I understand that of course they will get the ship back by the end of the next episode, but they really tipped their hand early. Matthew: My main beefs are two. First is that the crew would not do a check of all items controlled by these secondary processors and realize what was being targeted. There is no story reason they couldn't have figured it out, it could have added nice tension. Second is the apparently crucial element of Tierna exploding. How does Seska know where he will be kept? What if they keep him in the brig for the duration, or sickbay (for that matter, why didn't they?) Why would he volunteer to kill himself? Was he Seska's secret lover? Was he brainwashed? We're just not given enough of his motivation, and so it just seems weird. Kevin: Best of Both Worlds really set a bar that no one has, and honestly never will reach again. I first saw that episode two years after it aired and saw the two parts back to back, and I barely held it together for the commercial break, let a lone a summer. Other cliffhangers are fun, though I think Matt and I agree, ambiguous endings like DS9's Jem'Hadar or The Adversary function better as jumping off points for the next season. As cliffhangers go, though, this is pretty good. I wish we had gotten more on the planet in this episode before the break, but overall, even after an uneven season, I really wanted to know what happens. Matthew: I think this may well be the second best cliffhanger in the franchise (perhaps third, if Enterprise's "Shockwave" does it for you). The last ten minutes of the script were executed really well. I enjoyed seeing Janeway try to negotiate for her crew, and her remaining defiant and strong in the face of Culluh's physical abuse. I liked the basic idea of the crew losing their ship (though, why not kill them? ), and I really like the idea of stranding them on a world at an earlier stage of planetary evolution (I've been going to the Field Museum quote a bit lately). So all told, we've got a pretty good first third, a so-so middle, and a nicely crackling conclusion. Kevin: Everyone brought their A-game. We've criticized his acting before, but Beltran was great here. He connected well to the human, emotional elements of the story. One other piece of acting I want to single out is Mulgrew in the last scene. The look on her face when Culluh removes her combadge was perfect. It telegraphed about fifteen emotions in a second. Matthew: Beltran and Henry Darrow as Kolopak have wonderful chemistry. They should have seized on the obvious and made him a recurring character for Chakotay's visions. Their scene was truly excellent. I liked Mulgrew, but I thought a few of her gestures and expressions were a touch off during her conversation with Suder. Kevin: The Kazon didn't really excite me, but it's as much the writing as ever. Seska was oddly flat. I think that's a result of her transition from calculated Cardassian villainy to cartoonish super-villainy. Brad Dourif's Suder was again just awesome. He's an amazing character actor and for a part that could so easily go off the rails, he kept it simmering not boiling over the whole episode. Matthew: Suder should have been a regular, too. Having a convicted murdered on board for the whole trip is a great story idea. Having him be played by Grima Wormtongue? Come on. Having two such strong guest actors made up for the fact that all three of the Kazon antagonists were just so-so. Kevin: In the plus column, the depature shot of Voyager was much better done than the landing shot with the warped perspective we got in 37s. There was a panning shot of Voyager at warp as the camera followed the Kazon ship and I really liked that. Matthew: The location work in general was really well done. Yes, it's the Vazquez Rocks, again. But some creative matting and the nice look up at Voyager totally makes up for any sense of repetition. And hey, if you've got such a great location a stone's throw from the studio, can you really fault them for using it? Kevin: In the minus column, the explosion shot of Tierna was just....weird. I get what they were going for, but it showed the seams of the CGI in a really bad way. It just looked like someone was playing with one of the wipe settings. Matthew: The Tierna explosion and the Doctor in space were just subpar shots at this point. On the other hand, the space battles looked nice, with good optical work, staging and choreography. Kevin: In the balance, I am going with a 3. This is a good, entertaining episode, but once we get to the Kazon trap, the episode drags a little for me, and the mechanism of the trap itself seems like something they really should have picked up on. I think had the marooning happened earlier, even in the teaser, we could have gotten a sharper outing that spent more time on the most interesting idea here, what would Voyager do without its advanced technology? Still, this is a good episode and I am eager to see season 3. Matthew: I think this just scrapes into 4 territory. The problems are obvious and have been ably covered above, but some excellent scenes and a truly exciting cliffhanger keep this one brisk and entertaining. Do we know how it's going to resolve? To some degree. But I really want to watch it all come together, and that's saying something. That makes our total a 7.